This beach is 310 meters long by about 40 in width, the sands are nearly pure-white, very fine. The water is very tranquil and is a magnificent turquioise, emerald green colour. You can get to Cala Tarida by car, it is about a 15 minute drive from San Antonio, clearly sign posted from cala de bou. Cala Tarida can also be reached by a taxi ferry, more information can be found at the port of San Antonio. This beach is a very sheltered zone, buried within the beautiful landscapes that surround. Here you can find parsaoles and sun loungers on the beach, also some very tasteful resteraunts with spectacular sea views. The beach is supervised by lifeguards and is considered one of the cleanest bathing spots on the island this makes it a very popular place for families, although there is no real shade so be sure to bring some cover ups and plenty of sun cream! Cala Tarida is very famous for its 5 meter rock dive! Located just off the shore. You will notice people jumping when your there. 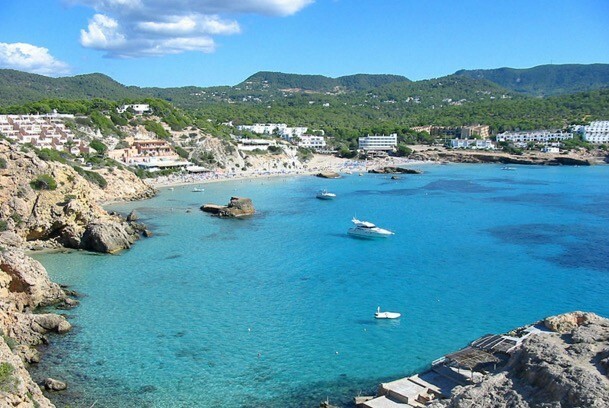 Also be sure to adventure out and see two small, virgin sanded coves located just right of cala tarida beach. You can swim or float out on your lilo to get there. Cala Tarida is one of the most popular beaches in the San Antonio area, because of its pure beauty, so it’s best to either arrive early and make a day of it or if you’re not a fan of crowds, stick to May, June and September so you can enjoy the surroundings more.. In the West zone of the island. Cala Tarida is reachable by car (15 mins from San Antonio) follow signs from either the San Antonio or San Jose direction. Good parking facilities are available. Or (much more fun) take the ferry from San Antonio, only 15 minutes and with regular services throughout the summer.